A few weeks ago I was contacted by Daphne from Chairish, asking if I would be interested in creating a style board based on one of the accent chairs from their latest collection. Daphne’s email was my first introduction to Chairish, and boy am I glad to have been introduced to them! Chairish is a fabulous, curator approved, online marketplace for vintage furniture. It’s a wonderful way for design lovers to sell and purchase pre-owned pieces. When I visited the site after reading my email, I was happy to accept the challenge. The theme of the challenge was to create a style board around a colorful accent chair for a room that is going from white to bright by adding in bold color. This was a fun challenge for me. As you know, I am addicted to black + white, but I love pops of color. I selected the Eames style molded plastic chair to create my space around. In keeping with my love of creative workspaces, I decided to use a home office as the room concept for my board. (I guess it was subliminal wishful thinking for me :) I took my room from white to bright by adding in color with my accessories. I love the green of the Eames chair (which happens to be a style I have had my eye on for a while). I wanted the space to have a luxe feel, so I chose accessories and furnishings with gold accents. I used abstract art to pull in more color and play off the gold and green. Touches of black helped to ground the room and add dimension and a nice contrast for the gold, green and yellow. Choosing colorful desk accessories, like pink pencils also helped to bring color and life to the space. These small things can make such a big impact. So for those of you who might be afraid of color, remember that you can always add in color through your accessories. The room still has a neutral base, but because of the bold pops of color, it doesn’t give off the feeling of being in a stark white room. Be sure to check out the Chairish site. You can shop their accent chairs here. It’s a great way to get your hands on vintage pieces! This entry was posted in Color Palettes, Interior Design, Interiors and tagged Chairish, Chairish Style Board Challenge, Eames molded plastic chair, style board, thelookbookphilosophy.com, vintage furniture on August 8, 2014 by thelookbookphilosophy. Interior Awesomeness . . . The juxtaposition of modern + classic in this room is superb! This entry was posted in Interior Design, Interiors and tagged classic, gray + white, modern, parisienne on January 25, 2014 by thelookbookphilosophy. Subliminal Desires: Hammock in Living Room . . . Happy Saturday! Keep those dreams alive!!! This entry was posted in Interior Design, Interiors and tagged hammocks, home decor, loft on January 18, 2014 by thelookbookphilosophy. 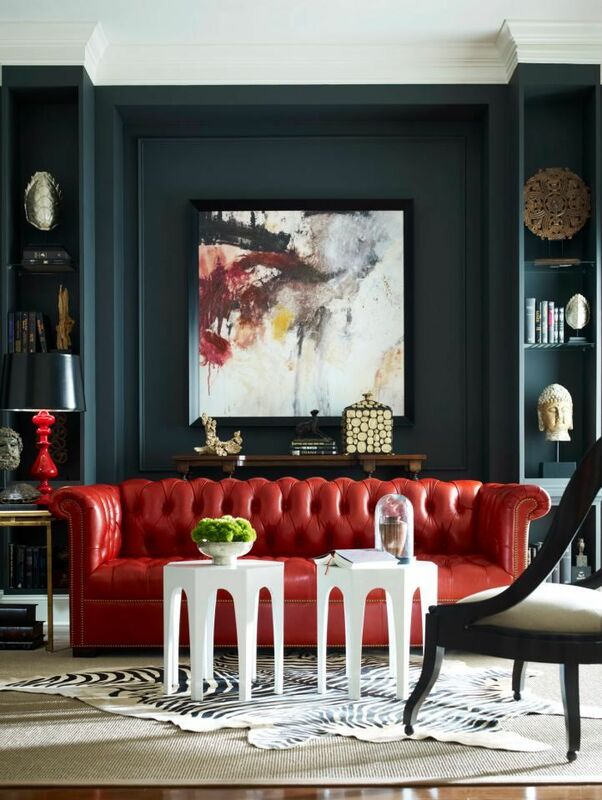 Living Spaces | Red Elegance . . . This is just gorgeous. I’ve never met a Chesterfield (or Chesterfield impersonator) I didn’t like. This red number and it’s surroundings are amazing! This entry was posted in Inspiration, Interior Design, Interiors, Living Spaces on October 11, 2013 by thelookbookphilosophy. Living Spaces | Current Inspiration: High Contrast Living . . . Lately, I can NOT get enough of simple black + white interiors & exteriors w/ a little glam thrown in. This is definitely what is moving me right now . . . This entry was posted in Interior Design, Interiors, Living Spaces and tagged black & white, high constrast on October 7, 2013 by thelookbookphilosophy. How yall doin? It’s been a minute since I touched base with you. I hope life is treating all of you well. My plate has been pretty full lately. All good stuff though. I’ve sort of fallen back into my old Project Manager role by coordinating, furnishing + installing my brother’s house. It’s so much fun, I could do this all day long, takes a lot of organization and planning, but I swear interior decor is my 3rd calling… (I won’t tell you what my 2nd calling is . . . I’ll just let your little minds ponder on that one! tee hee hee.) But I digress . . . naturally, as life would have it, I started back on my own ReDecor project, which was never really finished in the first place. The focus this time is my bedroom/office. I (translation: Rob) have painted myself into total and utter happiness! Who would’ve thought the color white could make one so happy!! I’ve been wanting to do a white-out for a while and it was well worth the wait. I feel like I am shedding my old skin!! We get so much beautiful sunlight in our bedroom throughout the day, and now our room is starting to take on a really fresh + crisp vibe. We have one accent wall (I guess when it came down to it I couldn’t totally give up color) and the rest are white, even the floor is white! Very Scandanavian . . . ☺ Anyway, the room is in flux, but I will post pics as soon as we (translation: he) is done. I snapped this pic of [the cleaner side of] my desk this morning. The new paint job just might make working out of my bedroom a little more bearable . . .
p.s. do you like my poster? It’s another one I designed specifically for my office. Just a friendly reminder to self . . . one can never have too many! This entry was posted in Interior Design, Interiors, Typography and tagged black & white, office space, ReDecor Project, White Out on May 9, 2013 by thelookbookphilosophy. In a Peaceful State of Mind . . . This entry was posted in Architecture, Interior Design, Interiors, Living Spaces, Style and tagged concrete floors, floor-to-ceiling-windows, minimal, woodland view on April 7, 2013 by thelookbookphilosophy.